I am pleased to welcome Arnab Chakraborty back to my talk show, “The Central Equilibrium“, to talk about the Monty Hall Problem and Bayes’ theorem. In this episode, he shows 2 solutions to this classic puzzle in probability, and invokes Bayes’ Theorem for the second solution. If you have not watched Arnab’s first episode on Bayes’ theorem, then I encourage you to do that first. Marilyn Vos Savant provided a solution to this problem in PARADE Magazine in 1990-1991. Thousands of readers disagreed with her solution and criticized her vehemently (and incorrectly) for her error. Some of these critics were mathematicians! She included some of those replies and provided alternative perspectives that led to the same conclusion. Although I am dismayed by the disrespect that some people showed in their letters to her, I am glad that a magazine column on probability was able to attract so much readership and interest. Arnab and I referred to one of her solutions in our episode. Thank you, Marilyn! Enjoy this episode of “The Central Equilibrium“! I am excited to present the first of a multi-episode series on neural networks on my talk show, “The Central Equilibrium”. My guest in this series in Layne Newhouse, and he talked about how to represent neural networks. We talked about the biological motivations behind neural networks, how to represent them in diagrams and mathematical equations, and a few of the common activation functions for neural networks. In SAS, you can perform PROC TTEST for multiple numeric variables in the same procedure. Here is an example using the built-in data set SASHELP.BASEBALL; I will compare the number of at-bats and number of walks between the American League and the National League. Here are the resulting tables. What if you want to perform PROC TTEST for multiple grouping (a.k.a. classification) variables? You cannot put more than one variable in the CLASS statement, so you would have to run PROC TTEST separately for each binary grouping variable. If you do put LEAGUE and DIVISION in the same CLASS statement, here is the resulting log. It allows you to use multiple grouping variables at the same time. It sorts the t-test statistics by their absolute values within each grouping variable. It shows the name of each continuous variable in the output table, unlike the above output. Here is its basic skeleton. I will speak on the career-advice panel at the 2018 Canadian Statistics Student Conference. It will be held on Saturday, June 2, at McGill University. If you will attend this conference or the subsequent Annual Meeting of the Statistical Society of Canada, then I strongly recommend students to read my following advice articles in advance. In a recent blog post, I introduced an easy and efficient way to create indicator variables from categorical variables in SAS. This method pretends to run logistic regression, but it really is using PROC LOGISTIC to get the design matrix based on dummy-variable coding. I shared SAS code for how to do so, step-by-step. I write this follow-up post to provide a macro that you can use to execute all of those steps in one line. If you have not read my previous post on this topic, then I strongly encourage you to do that first. Don’t use this macro blindly. I will use the built-in data set SASHELP.CARS to illustrate the use of my macro. As you can see, my macro can accept multiple categorical variables as inputs for creating indicator variables. I will do that here for the variables TYPE, MAKE, and ORIGIN. In statistics and biostatistics, the creation of binary indicators is a very useful practice. They can be useful predictor variables in statistical models. They can reduce the amount of memory required to store the data set. They can treat a categorical covariate as a continuous covariate in regression, which has certain mathematical conveniences. However, the creation of indicator variables can be a long, tedious, and error-prone process. This is especially true if there are many categorical variables, or if a categorical variable has many categories. In this tutorial, I will show an easy and efficient way to create indicator variables in SAS. I learned this technique from SAS usage note #23217: Saving the coded design matrix of a model to a data set. In this video tutorial on YouTube, I use the exponential distribution’s moment generating function (MGF) to obtain the expected value of this distribution. Visit my YouTube channel to watch more video tutorials! In this video tutorial on YouTube, I derive the moment generating function (MGF) of the exponential distribution. Visit my YouTube channel to watch more video tutorials! Arnab Chakraborty kindly came to my new talk show, “The Central Equilibrium”, to talk about Bayes’ theorem. He introduced the concept of conditional probability, stated Bayes’ theorem in its simple and general forms, and showed an example of how to use it in a calculation. It was a great pleasure to talk to Christopher Salahub about Markov chains in the second episode of my new talk show, The Central Equilibrium! Chris graduated from the University of Waterloo with a Bachelor of Mathematics degree in statistics. He just finished an internship in data development at Environics Analytics, and he is starting a Master’s program in statistics at ETH Zurich in Switzerland. Chris recommends “Introduction to Probability Models” by Sheldon Ross to learn more about probability theory and Markov chains. I often need to work with many variables at a time in SAS, but I don’t like to type all of their names manually – not only is it messy to read, it also induces errors in transcription, even when copying and pasting. I recently learned of an elegant and efficient way to store multiple variable names into a macro variable that overcomes those problems. This technique uses the INTO statement in PROC SQL. To illustrate how this storage method can be applied in a practical context, suppose that we want to determine the factors that contribute to a baseball player’s salary in the built-in SASHELP.BASEBALL data set. I will consider all continuous variables other than “Salary” and “logSalary”, but I don’t want to write them explicitly in any programming statements. To do this, I first obtain the variable names and types of a data set using PROC CONTENTS. My Alumni Profile by Simon Fraser University – Where Are They Now? I am happy and grateful to be featured by my alma mater, Simon Fraser University (SFU), in a recent profile. I answered questions about how my transition from my academic education to my career in statistics and about how blogging and social media have helped me to advance my career. Check it out! During my undergraduate degree at SFU, I volunteered at its Career Services Centre for 5 years as a career advisor in its Peer Education program. I began writing for its official blog, the Career Services Informer (CSI), during that time. I have continued to write career advice for the CSI as an alumnus, and it is always a pleasure to give back to this wonderful centre! You can find all of my advice columns here on my blog. I have accepted an offer from the Bank of Montreal to become a Manager of Operational Risk Analytics and Modelling at its corporate headquarter office in Toronto. Thus, I have resigned from my job at the British Columbia Cancer Agency. I will leave Vancouver at the end of December, 2015, and start my new job at the beginning of January, 2016. I have learned some valuable skills and met some great people here in Vancouver over the past 2 years. My R programming skills have improved a lot, especially in text processing. My SAS programming skills have improved a lot, and I began a new section on my blog to SAS programming as a result of what I learned. I volunteered and delivered presentations for the Vancouver SAS User Group (VanSUG) – once on statistical genetics, and another on sampling strategies in analytical chemistry, ANOVA, and PROC TRANSPOSE. I have thoroughly enjoyed meeting some smart and helpful people at the Data Science, Machine Learning, and R Programming Meetups. I lived in Toronto from 2011 to 2013 while pursuing my Master’s degree in statistics at the University of Toronto and working as a statistician at Predicum. I look forward to re-connecting with my colleagues there. I am excited to present at the next Vancouver SAS User Group (VanSUG) meeting on Wednesday, November 4, 2015. I will illustrate data transposition and ANOVA in SAS and JMP using potato chips and analytical chemistry. Come and check it out! The following agenda contains all of the presentations, and you can register for this meeting on the SAS Canada web site. This meeting is free, and a free breakfast will be served in the morning. Update: My slides from this presentation have been posted on the VanSUG web site. If you would like to be notified of upcoming SAS User Group Meetings in Vancouver, please subscribe to the Vancouver SAS User Group Distribution List. 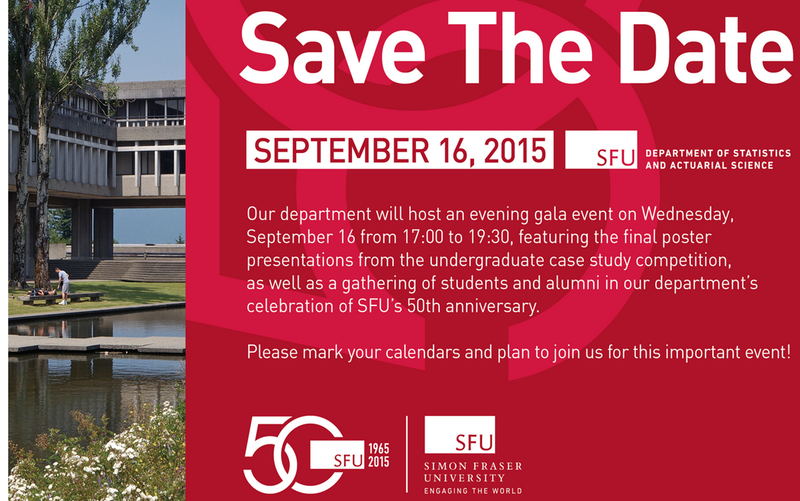 I look forward to attending the #SFU50 Gala at the Department of Statistics and Actuarial Science at Simon Fraser University on Wednesday, September 16, 2015. There will be a poster presentation of undergraduate case studies, a short awards ceremony, and many opportunities to network with current and former students, professors and staff from that department. If you will attend this event, please come and say “Hello”! Screenshot captured at 5:35 pm Vancouver time on Wednesday, August 12, 2015. Out of curiosity, I wanted to reproduce this result. This event is an intersection of 15 independent Bernoulli random variables, all with the probability of the home team winning being 0.5. Now, let’s connect this probability to odds. The above article states that the odds is 1 in 32,768. The fraction 1/32768 is equal to 0.00003051757, which is NOT the odds as I just calculated. 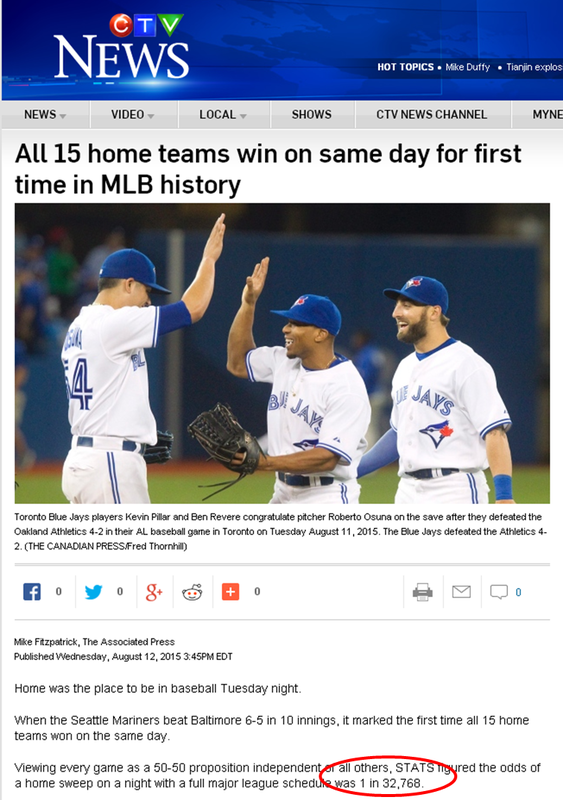 Instead, 0.00003051757 is the probability of all 15 home teams winning. Thus, the article incorrectly states 0.00003051757 as the odds rather than the probability. This is an example of a common confusion between probability and odds that the media and the general public often make. Probability and odds are two different concepts and are calculated differently, and my calculations above illustrate their differences. Thus, exercise caution when reading statements about probability and odds, and make sure that the communicator of such statements knows exactly how they are calculated and which one is more applicable.